SCLC President/CEO Dr. Charles Steele talks about voting rights and voter suppression issues with Alabama Congresswoman Terri Sewell. Congressman Bobby Rush, Illinois, discusses program support for SCLC national agenda items. Long time friend of SCLC, Congresswomen Corrine Brown (Florida) meets with President Steele to discuss Steele’s remarks at National Summit on Overcoming Poverty. (May 22, 2015) Washington, DC – In his keynote address at the National Summit on Overcoming Poverty at Georg/etown University (which SCLC co-sponsored) Dr. Charles Steele, Jr. spoke to the critical need for bridge building between religious boundaries in order to push the issue to the front of the national policy agenda. The idea of the three-day conference blossomed from conversations with officials of the host organization (Initiative on Catholic Social thought and Public Life, Georg/etown University) and Dr. Steele. This prestigious gathering brought together invited leaders from the Catholic, evangelical and broader religious community as well as key policymakers, researchers and community leaders. Dr. Steele spoke directly and forcefully on Dr. King’s “economic dream” of eradicating poverty in America. 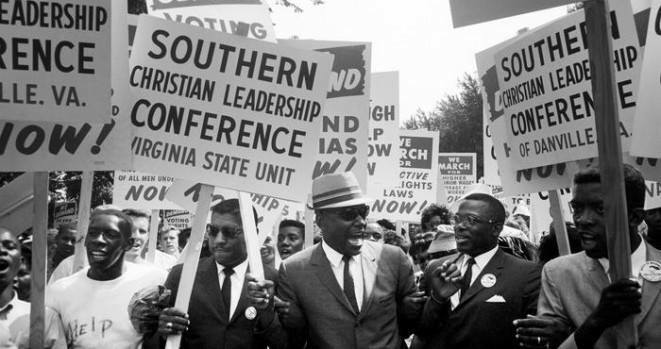 Steele outlined the SCLC’s current efforts through the organization’s Poor People Campaign. He stressed the need to create allies in the fight against poverty. “I believe that this country must make ending poverty a priority on the national agenda. We can end poverty in the United States for all Americans, but only through the action of government, not inaction as we have seen it. Government will only act, if we form a collective, to force it to, “ said Steele. By working with other like-minded individuals and organizations, Steele pledged that the SCLC stands committed to champion this cause and will continue the organization’s mission to encourage presidential and congressional action in this regard. Steele concluded his Washington, DC visit by meeting with members of the Congressional Black Caucus to seek support of SCLC National Agenda and Initiatives.